I have donated this painting to an auction in aid of the Teenage Cancer Trust to be held on Thursday 14th June 2012 at 7.30pm at Wickwoods Country Club in Hassocks. ‘Sit and Throw’ is an early piece in a popular series titled ‘The Groyne Series’ that depicts teenagers and kids having fun and hanging out on the stone walled sea groynes along the shoreline of the beach where I live in Brighton. Often submerged, the groynes are revealed as the tide changes and make ideal platforms for jumping into the sea or ‘tomb stoning’, as it’s referred to in the media. The series came about from observing these lively activities on those (rare) sunny days spent by the seaside at my local beach, although people often remark that the scene could be anywhere in the world. The silhouettes of the figures are defined against the brightness of the sky, evoking fond memories of the height of summer. Several in this series have already been sold at previous exhibitions. 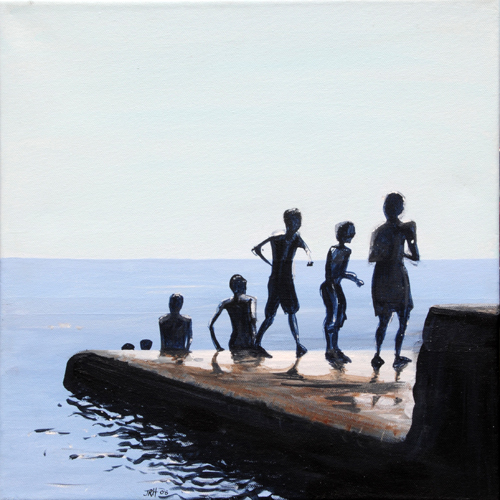 All the initial mini 10x10cm paintings have been snapped up, but this is the first 40 x 40 cm canvas in the series. To view the other works in the series take a look at The Groyne Series Gallery on my website. Local established artists have kindly donated work to be auctioned off in a Silent Auction format. Each painting will be assigned a number and there will be ballot points where you are able to fill out your contact details and the highest amount you wish to bid on the painting. Teenage Cancer Trust is the only UK charity dedicated to improving the quality of life and chances of survival for the six young people aged between 13 and 24 diagnosed with cancer every day. All proceeds from the auction will go to the Teenage Cancer Trust. This entry was posted in Art, Daily Life, Exhibited, Painting, Uncategorized and tagged acrylic, Art, artist, atmosphere, auction, beach, beauty, birds, blue, Brighton beach, Brighton marina, Charity, children, cloud formations, clouds, dive, diving, east Sussex, formations, gallery, jump, kids, landscape, Local News - Brighton, paint, painter, Painting, paintings, paints, palace pier, pebbles, picture, pier, playing, reflection, sea, seafront, seaside, silhouette, sky, starlings, summer, sun, sunset, sunshine, swimming, Teenage Cancer Trust, tidal, tomb stoning, wall, west pier. Bookmark the permalink.